Wireless Camera with Arduino and the Adafruit CC3000 breakout board « Adafruit Industries – Makers, hackers, artists, designers and engineers! Wireless Camera with Arduino and the Adafruit CC3000 breakout board. One nice thing to have in any home automation or alarm system is a camera to see what’s going on remotely. Of course, such solutions already exists, and you even have WiFi cameras that you can buy for under $50. But they are not open-source, and therefore it is difficult to have the control on what’s going on, or to customize the interface. 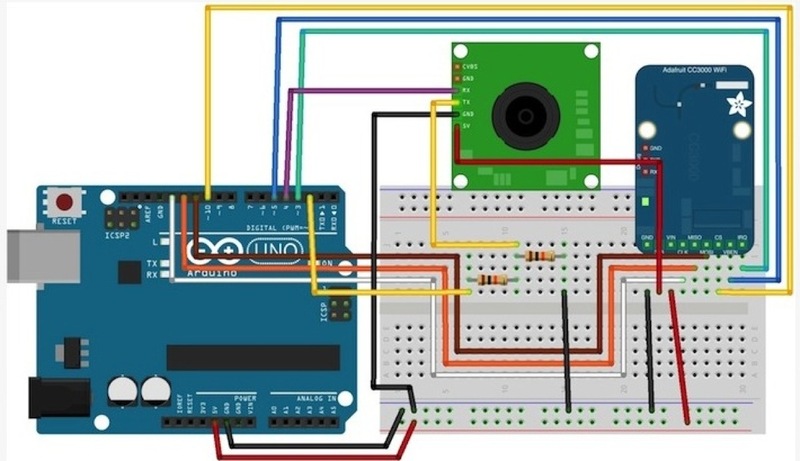 In 2012, a nice tutorial was published on how to build such a connected camera. You can find the tutorial here. We will do something different in this article: we will use the CC3000 WiFi chip and the Arduino platform, along with a serial camera, to build you own wireless camera. You will learn how to take still pictures from your home and display them on your computer remotely. Let’s dive in!